The backchannel talks were held from June 5 to 10 appeared to be successful with only the joint agreement signed by both parties needed to be released to the public. The agreements on the scheduled peace negotiations this month was signed by the respective chairpersons of the GRP and the NDFP negotiating panels, Labor Secretary Silvestre H. Bello III and Fidel V. Agcaoili, on June 9. It was witnessed by the Royal Norwegian special envoy Ambassador Idun Tevdt, as part of the third party facilitator of the GRP-NDFP peace talks. National Democratic Front of the Philippines (NDFP) Chief Political Consultant Jose Maria Sison said briefly of the informal talks that the stand-down agreement would have to be moved to June 21 and the formal talks would proceed from June 28 to 30 in Oslo, Norway. He deferred to his counterparts on the peace table to release other details. Dureza commented it was only Sison who had prematurely announced the resumption of the talks by end of the month. “In our common effort to make sure that we achieve a conducive and enabling environment for peace, President Duterte instructed us last night to engage our bigger ‘peace table’ – the general public, as well as other sectors in government as we work to negotiate peace with the communist rebels,” Dureza said. “Consequently, the initial timeline that our backchannel team had worked on with their counterparts (CPP/NPA/NDF) ‘across the table’ had to be necessarily re-adjusted,” he said. Dureza did not say when the talks would resume. 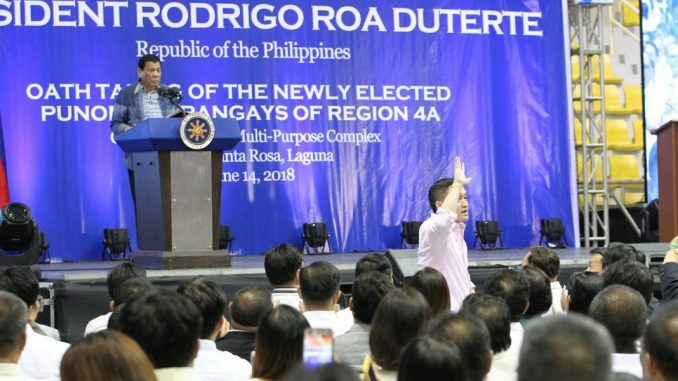 Duterte, however, said at the oath-taking of barangay officials in Sta. Rosa, Laguna on June 13 that the talks may have to be deferred until July as he needed more time. Following the backchannel talks in The Netherlands, the NDFP was informed that the Government of the Philippines (GRP) panel was scheduled to meet their principal, Duterte, on June 13 to report on the progress of the informal talks. Presidential Spokesperson Harry L. Roque, Jr. said Duterte’s joint command conference on Wednesday night with the Armed Forces of the Philippines (AFP) and Philippine National Police (PNP) dealt with the peace talks. Roque said the AFP and the PNP had made a commitment to the president to support the peace talks. The next day saw the announcement to cancel the fifth round of peace talks for the third time. An interim peace agreement was expected to be signed consisting of a coordinated unilateral ceasefire. The coordinated unilateral ceasefire was supposed to replace the stand down agreement. The deal was predicated on signing agreements on agrarian reform and rural development and amnesty proclamation for political prisoners. The cancelled talks halted yet again the progress on the Comprehensive Agreement on Social and Economic Reforms (CASER). The CASER is said to be the heart of the three-decades long peace negotiations as it tackles the roots of the armed conflict. “It is interested vainly in obtaining the NDFP capitulation under the guise of an indefinite ceasefire agreements and breaking the provision in the GRP-NDFP Joint Agreement on the Secuirty and Immunity Guarantees (JASIG) which requires formal negotiations in a foreign neutral venue and therefore putting the negotiations under the control and under duress of an emerging fascist dictatorship and its armed minions,” he explained. “I urge the two negotiating panels to release to the public and to the press the written and signed agreements of June 9 and 10 signed by the chairmen of the GRP (government) and NDFP negotiating panel and by the members of their respective special teams,” Sison said. On April 8, Duterte gave the GRP and NDFP panels to start come up with an agreement within 60 days or there will be no more talks. He also asked Sison to come home to for the peace talks. The post GRP cancels peace talks despite successful informal talks appeared first on Manila Today.